Aubrey Hand laced his shoes and stepped out onto the track. Men and women took notice, pausing their conversations and easing over closer to see what would happen next. Hand looked down at his feet, took a breath and took off. Cheers erupted. It felt like a victory. But this is a long race, and he’s nowhere near the finish line. On that day in late 2016, he was far from South Carolina, where he once ran cross country and track at Spartanburg Methodist College. He was at Walter Reed National Military Medical Center in Bethesda, Maryland, jogging for the first time since doctors amputated his left leg below the knee. Four years earlier, as the senior airman drove back to base at the end of a route clearance mission in Bagram, Afghanistan, a 200-pound homemade bomb exploded beneath his vehicle. In the moment, Hand ignored the pain. He got out of the vehicle, secured the area, waited for help to arrive and returned all of his fellow troops alive that day. But the blast shattered his left heel, ravaging the tendons, joints and cartilage from his foot up through his ankle. The years that followed included one surgery after another. He tried every brace he could find, every orthotic he could slip into his shoe. He walked with a cane or scooted along on a knee cart. He begrudgingly accepted a medical retirement. “I came to the realization that, if it’s not going to get any better, why keep it?” Hand said. On July 1, 2016, doctors took his foot and part of his left leg. The spectators who months later cheered his progress on the track were fellow amputees, people who knew the importance of that moment. They were prosthetists and occupational therapists and physical therapists, people whose careers are dedicated to helping a generation of American service members learn to live again without limbs. Together, they are part of a giant support system for the nearly two dozen patients recovering at Walter Reed’s amputee clinic. Well over 1,500 American troops have lost a limb since 2001, in Afghanistan or Iraq or other deployments around the world. 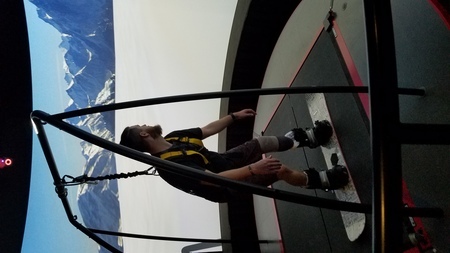 Walter Reed — first at the old campus in Washington, D.C., and now at the new facility in Bethesda — is where they take their first steps toward a new reality. In the fabrication room, the pieces lay scattered across rows of long tables. The sockets and the joints. The feet and the hands. This is where a team of certified prosthetists, technicians and administrative staff, more than a dozen in all, create and assemble an assortment of prosthetic limbs and attachments, empowering patients to regain mobility and independence, returning them to the life they want to lead. Prosthetist Todd Sleeman joined the team at Walter Reed in 2011, shortly after the volume of incoming patients peaked around the turn of the decade. At one point, nearly 250 amputees lived on Walter Reed. That number has fallen, mercifully, to around 20 or 25. Sleeman works closely with his patients, learning their needs in the present and their goals for the future. Every socket — connecting the prosthesis to the end of the limb — is made in house, cast and molded to snugly fit each patient. Prosthetist Todd Sleeman works closely with his patients, learning their needs in the present and their goals for the future. Every socket — connecting the prosthesis to the end of the limb — is made in house, cast and molded to snugly fit each patient. Team members order other pieces of the prosthesis from outside companies and then assemble the elements at Walter Reed to create a personalized limb – often multiple limbs – for each patient. Sleeman builds prosthetics specifically for lower extremities. The opportunity to serve young, fit, athletic and motivated patients was one of the factors that brought Sleeman to Walter Reed. He and his colleagues try their best to create whatever those patients need. Working for the U.S. military frees them from some of the limitations faced by their civilian counterparts. In less than two years after his amputation, Hand has feet designed for everyday use, he has two types of running feet and an extreme foot designed for snowboarding, mountain biking or motocross. He planned to get a foot designed just for golf. For 11 years, Joe Butkus has followed the ebbs and flows of our nation’s military conflicts by watching new patients arrive at Walter Reed. Butkus, an occupational therapist, can tell when a conflict has evolved or tactics have shifted by the types of wounds that patients arrive with. He begins by explaining to the patient and their loved ones what occupational therapy entails. In short, occupational therapy helps patients regain independence by re-learning basic tasks under their new set of circumstances. From feeding themselves to cooking and cleaning, all the way up to driving a car and preparing for job interviews, occupational therapy prepares patients for a return to everyday life. At Walter Reed, the process begins inside the patient’s hospital room, with tasks as small as learning to use the call button. The therapy progresses as the patient does. Hand lost his leg below the knee. Relative to some of the more severe amputee cases, his recovery is less complex. Patients with above-the-knee amputations, or even multiple amputations, face a longer road. Patients with upper-extremity amputations face different challenges than patients with lower-extremity amputations. Of the four quadruple amputees who have come through Walter Reed, each has driven themselves out when they left. That success is the result of adaptive technology and long hours of hard work. Occupational therapy patients at Walter Reed can be found throughout the rehab facility. One area features a full kitchen where they can practice making their own meals. It can be challenging physically — navigating the kitchen and preparing the food. In some cases, it’s difficult mentally because patients with traumatic brain injuries can struggle to follow instructions or remember the necessary steps. You might also find patients assembling elaborate structures using blocks or LEGOs, an excellent way to improve focus and regain fine motor skills. Again and again, Butkus has watched the process play out, taking satisfaction as each patient grows independent and confident, ready to start their life again. Not long after physical therapist Kyla Dunleavy arrived at Walter Reed in 2003, she received an exciting, if challenging, invitation. Annette Bergeron, who led the physical therapy team, asked Dunleavy to join her in the newly formed amputee clinic. And in the years that followed, as hundreds of amputees streamed into their clinic, they did figure it out. They learned, they adapted and they gave patients the physical tools to adjust to their new lives. The physical therapy clinic at the new Walter Reed is spacious and open. Dunleavy is one of four physical therapists and two technicians leading patients through exercises aimed at gaining strength and mobility. The clinic is filled with reliable, low-tech equipment — tables and mats, parallel bars and exercise balls — as well as some of the most high-tech machines to hit the market. A walking track encircles it all, with straps descending from the ceiling to help support a patient’s weight as they first learn to walk again. Inside the clinic, a unique dynamic takes shape. The patients see one other every day. They encourage each other and compete with each other. Medal of Honor recipient Florent Groberg saw it firsthand when he visited the clinic. An Army captain, Groberg was medically retired after sustaining severe injuries in Afghanistan. During the visit, friendly small talk with patients took a turn. One of them challenged Groberg to crank out some reps on the bench press. And no one is immune. During the last months of his presidency, Barack Obama arrived for an unpublicized visit. The president asked Dunleavy to show him some of the exercises she does with patients. Under Dunleavy’s instruction, the commander in chief completed a series of agility drills, nothing too strenuous. Then a patient suggested she challenge Obama to do the two-foot box jump. “No, I don’t want to ask him to do that,” Dunleavy said, imagining the president of the United States injuring himself in her clinic. He did it three times. Dunleavy exhaled. Of course, this culture thrives because the physical therapists are no pushovers, either. They’ve learned what it takes for patients to reach their goals, and they know how to get their patients to put in the effort required. Hand credits much of his progress to Julie Castles, his primary physical therapist. Since his amputation, Hand learned to walk with his prosthesis. He learned to run with his prosthesis. He also learned to snowboard — something he never did with two good legs. He traveled with fellow veterans to Breckenridge, Colorado, for a snowboarding trip. He had another trip set for Vail later in the year. Since the day he jogged for the first time after his amputation, Hand has picked up the pace, growing more comfortable doing something that once came so natural. It’s different now, he admits. He carries his body differently. He uses his arms differently. But he’s getting there. Each day he gets closer to the finish line. –Derek Turner is a freelance writer and a former senior editor of On Patrol, the magazine of the USO. "Art definitely - and writing - saves my life." See how the art studio inside the USO Warrior and Family Center - Fort Belvoir is changing the lives of recovering service members.